There’s plenty of talk in the air about the iPhone 7, but with all of the speculation that surrounds every Apple product’s release it’s hard to know what’s true and what’s just a rumour. Judging from the accuracy (or inaccuracy) of tech gossip from past years there’ll at least be plenty of incorrect guesses to laugh at once the phone is released because while hindsight is 20/20, disproven old tech rumours are 100/100. We’ve dug up some hilarious, intriguing and plain off-the-mark predictions from past iPhone releases that will leave you either face-palming for days or seriously wishing for a matte black iPhone. It’s no secret that people often make too much of concept art, and this graphic from 2009 of the misnamed and wedge-shaped “iPhone 4Gs” shows that falling for hype is hardly new. This design assumed that the then-new Macbook Air signaled the whole brand’s shift to ultra-thin territory and away—or, judging from the proposed design, half-away—from the bulbous back of the iPhone 3 series. It’s probably good that we got the brick-shaped iPhone 4 that we all loved instead of this admittedly sleek Magic Mouse of a future phone. After all, the iPhone 6 strayed a little close to the line of being too thin, initially leaving a handful of gadget-sitters with deformed phones #bendgate. People have been thinking wishfully about alternatively coloured iPhones since before the plastic 5C got banished to the “things we don’t talk about” section of Apple’s back catalogue (someone out there still loves you, iPad Mini). 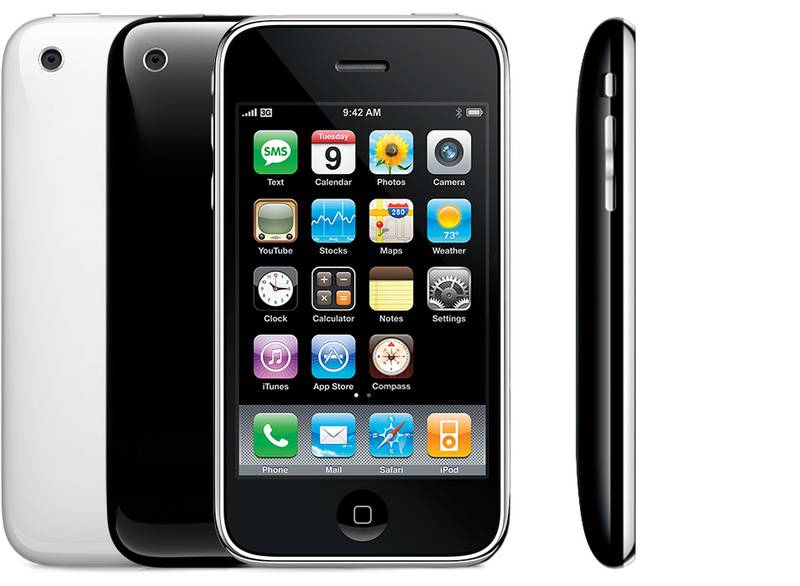 In 2009, rumours flared that the iPhone 3G would feature a matte black backing, with some bloggers even musing that they hoped that it would be made of rubber. While it was a rather handsome (though admittedly very 2009) design option, Apple’s penchant for shiny plastic and brushed aluminium is well and truly here to stay. The same set of speculations also suggested that the 3G would have a light-up Apple logo on its back the way that Apple’s computers do. The fanatic within us would have loved a light up Apple logo on the back…but the thought of it eating into your already limited battery does not sound great. Hubbub surrounding the iPhone 6s release in 2014 revived a rumour that the phone might have a curved body or glass display, slanting in the way that the Galaxy Edge’s screen does. As anyone who’s dropped their phone on a beach trip can attest, it can be infuriating to try and dig out little particles from its ports and speakers. We sort of wish that this rumour—that Apple intended to cover the iPhone 6S speakers and microphone with mesh—had been true. With some specs and images of the iPhone 7 having been leaked to the public, we’re pretty sure that while the headphone jack might be disappearing, the home button—rumoured since 2015 to be headed on its way out—is not being removed. It’s also not being made touch-sensitive or, as people speculated about the 4S in 2011, elongated to allow for gestural integration – but we don’t that this is the last we’ll hear of the maybe-disappearing home button. Any major rumours you think we’ve missed? Got your own thoughts on what we might expect to see from the iPhone 7? Let us know in the comments below – because there really is no rest for the Apple rumour mill.